Biblioteca Camões – Shhh I’m reading here! When you go exploring the city center, the last thing you’ll be looking for is a library. But this one is worth the visit – and you will surely pass by it anyway! Camões is considered by some as Portugal’s greatest poet – we often say that Portuguese is the language of Camões. Born in the 16th century, he is known for the modern epic “Os Lusíadas” which tells Portugal’s history and achievements in a beautiful poetic way. 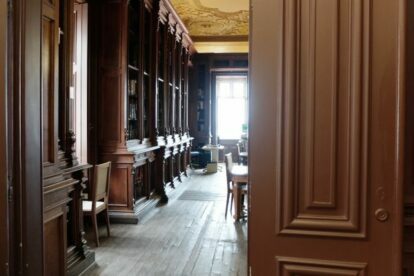 He also lost an eye during combat as a soldier for the Portuguese army, and coincidently or not, this library was first publicly used as a library for the blind, back in 1973 – opening up for everyone in 1981. It is located right in the heart of downtown Lisbon in the 1st floor of an old 15th century palace that was rebuilt after being destroyed in the 1755 earthquake. It is very discreet and easy to miss in between the other buildings, if you don’t pay attention. With different study/reading zones and awesome views of the city from the windows, it is a very calm and inspiring place – you feel smarter just stepping in! Go there for the architecture, for the reading, for the magazine collection, for the free internet, for the amazing light shinning on the old wooden corridors, for the silence and the calmness that you only find amongst books. But go. And enjoy!